Whitton’s name probably means ‘white farmstead’ and it was first recorded (as Wytton) in 1274, when this was a hamlet on the edge of Hounslow Heath. The German artist Sir Godfrey Kneller was the leading portrait painter of his day and founded the English Academy of Painting in 1711, the same year that he moved into Kneller Hall, his newly built home in Whitton. In the 1720s and 30s the Earl of Islay, later third Duke of Argyll, laid out Whitton Park and built a stuccoed ‘green­house’ and a Palladian villa that came to be known as Whitton Place. The green­house was converted into a mansion in about 1766. 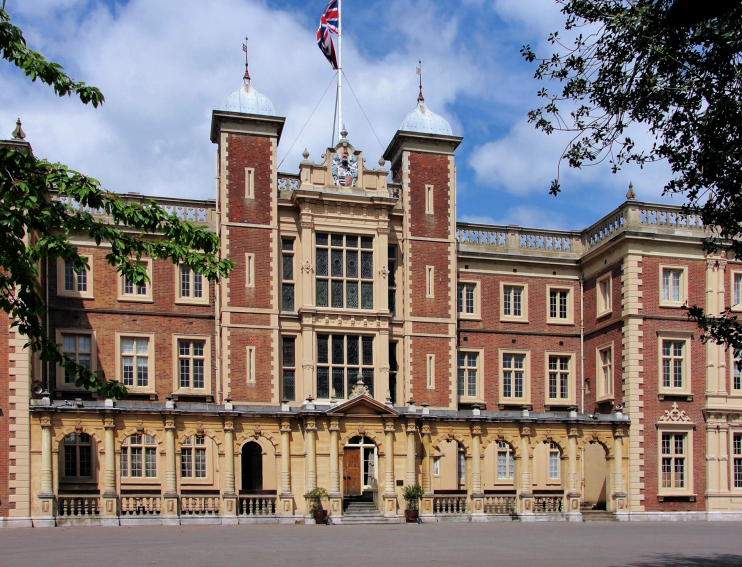 In the late 1840s Whitton Place and the first Kneller Hall were both demol­ished and the latter was replaced by the present building (shown in the photo­graph above*), where the Duke of Cambridge founded the Royal Military School of Music in 1857. Whitton did not acquire a separate church from Twickenham until 1862 and was still largely rural in character, with several straw­berry gardens, until suburb­an­isation began in earnest at the beginning of the 20th century. In the early 1910s developers knocked down Whitton Park’s fine old buildings – including the greenhouse/​mansion – and laid out a housing estate over the following 20 years. The Chertsey Road sliced off the district’s south-east corner in the early 1930s. Later in that same decade Whitton acquired a High Street, with around a hundred shops, on what had previ­ously been a peaceful stretch of Percy Road. By 1950 bungalows and semi-detached houses had covered most of Whitton’s former gardens and parkland. Twickenham academy opened at the south-western end of Percy Road in 2010, originally occupying the former classrooms of Whitton school. A new main building was completed in 2013 at a cost of £21 million. Because of the proximity of desirable Twickenham, house prices have risen relat­ively rapidly in recent decades, especially in what estate agents call the Kneller Hall area, where new homes have been built whererever they can be squeezed in. More than four-fifths of Whitton’s dwellings are owner-occupied, a very high proportion. The Kneller Hall Museum possesses a “small but fascin­ating” collection of instru­ments and other inter­esting articles with connec­tions to military music, including a rare jingling Johnny and a bugle that sounded at the Charge of the Light Brigade. The museum is open on the last Saturday of every month – or by prior arrangement. During the summer months the Royal Military School of Music stages a short series of outdoor concerts at Kneller Hall. In the mid-1970s the singer/​songwriter Elvis Costello lived in the newly built Palgrave House, Cypress Avenue. His father lived in another flat in the same block, not far from the Royal Military School of Music, where his father had learned his craft as a trumpet player. * The picture of Kneller Hall at the top of this page is adapted from an original photograph at Flickr, copyright Maxwell Hamilton, made available under the Attribution 2.0 Generic licence. Any subsequent reuse is freely permitted under the terms of that licence.